Muscat Belediyesi, Satko Araç Takip Sistemleri ile %51 Yakıt Tasarrufu Sağladı. 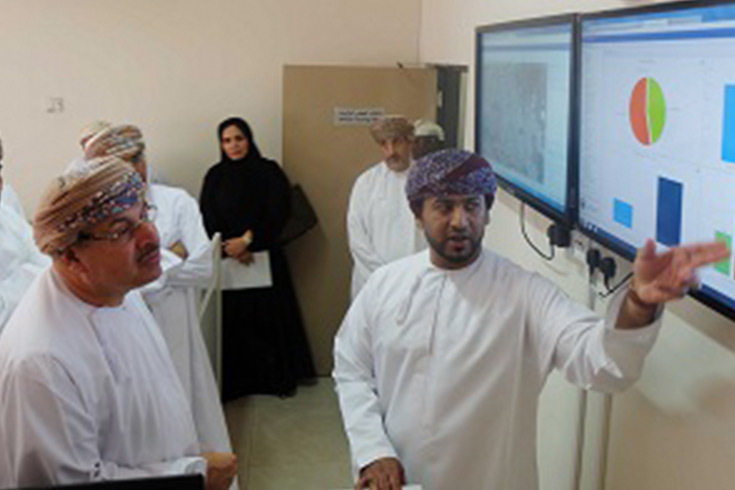 Head of Muscat Municipality Mohsen Bin Mohamed al-Shaikh inaugurated Sunday project of tracking Muscat`s vehicles in the General Directorate of Transportation in Grand Valley district, in the presence of number of officials and programming and technologies specialists. During the inauguration, General Manager assistant of transportation directorate Eissa Bin Salem al-Reiamy demonstrated some explanations about the new device that provides high level technological services of the GPS tracking system, noting that such system can identify places of vehicles by GPS maps and can know the very accurate details about it. The new system can draw the real place of a vehicle on the map and can pursue its movements at any time. In addition, it can identify the vehicle`s speed and directions, by providing the central system with coordinates continuingly through an a device fixed in it. The system consists of computer, programs specialized in controlling vehicles and special apparatuses for sending and receiving details. The details are transferred from the apparatuses to the computer through the program. According to Eissa, the program targets maintaining vehicles, reducing expenses, raising productivity service level, improving safety conditions, and making sure of discipline of vehicles drivers. The new system of tracking vehicles has been applied in all directorates and unites of municipality, which means that the system is currently covering 332 vehicles as an initial stage, including 105 trucks and 227 cars, noting that all Muscat Municipality will be included soon. The vehicles tracking system has several privileges, including identifying location of vehicle continuously, tracking its speed and movements through the satellites working in the tracking champers through internet systems. The system`s program can also assure if the vehicle takes the best and shortest way in its mission, uncover unnecessary trips and the extra taken kilometers, which saves power of vehicle and fuel consumed. Meanwhile, the System can compare times taken in different trips and the long time parking as well as appointments of arrival to and departure from work sites. Ill-usage of vehicles represented in loosening seatbelt, rough braking, and rough turning in curves can be uncovered by the system. Efficiency of the system has been approved in the study about the system`s power to save taken distances, and to consume fuel that had been run by the Muscat Municipality through comparing fuel consumed in the first quarter of 2013 to the fuel consumed in the first quarter of 2014, by collecting data about movements records and fuel consumed from fuel offices in the directorates. According to the study, rate of cars operation has increased by 52percent. Total distance taken by light-duty vehicles reached to 11804 kilometers while distances taken by heavy-duty vehicles reached to 355215. In addition, 108 liter has been saved in the light- duty vehicles, while other 17 liter has been saved in the heavy-duty vehicle. Total saving of fuel in the light-duty vehicles is 24516 liter, against 18690 liter in heavy-duty ones. Performance of heavy-duty vehicles is improved by 24,6 percent, against 23,50 percent in the light-duty vehicles. Fuel usage improved in the light-duty vehicle to 1, 74 kilometer by the only one liter and in the heavy-duty vehicle to 0, 70 kilometer by the only one liter. KVKK aydınlatma metnini okudum kabul ediyorum. Şirketiniz için en uygun araç takip firmasını araştırıyorsanız, büyük olasılıkla aşağıda isimlerini verdiğimiz firmalar karşınıza çıkıyordur. Araç takip sistemi fiyatları hakkında bilgi sahibi olmak için yazımızı okuyun. Araç takip sisteminin nasıl çalıştığı konusunda detaylı bilgiye sahip olmak için bilgilendirme yazımızı okuyun. Araç takip sisteminin gerekliliği konusunda detaylı bilgi sahibi olmak için yazımızı okuyun. Satkoyu neden tercih etmeniz gerektiği konusunda hala tereddütleriniz varsa önce yazımızı okuyun. Nedim Çelebiler , TechnoLogic'e Araç Takip Sistemlerini Anlatıyor. Erbil Uluslararası Autoshow’unda Satko'nun yeri hakkında detaylı bilgi sahibi olmak için lütfen yazımızı okuyunuz. Vodafone Parter Event’te M2M Ticari Başarı Ödülü 2014'te Satko'ya Gidiyor. Ayışığı Ulaştırma Tren Takibinde Satko’yu Seçti. Ayışığı Ulaştırma'nın Da Seçimi Satko'dan Yana. Muscat Belediyesi'nin de Tercihi Satko'dan Yana. Satko Teknoloji Sistemleri San. ve Tic. A.Ş. Adres: Satko Teknoloji Sistemleri San. ve Tic A.Ş.